KartingRace is a fast paced gokart racing game, featuring detailed 3D graphics. Imagine yourself 10 centimeters above ground, cornering the track with a speed of no less than 90mph! The game offers two race-modes; practice (just you and the track), race (you against 1-5 opponents). 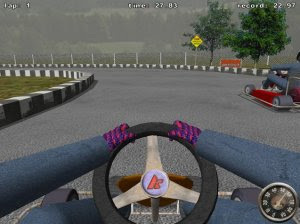 The game supports keyboard, mouse, joystick and steering wheel.